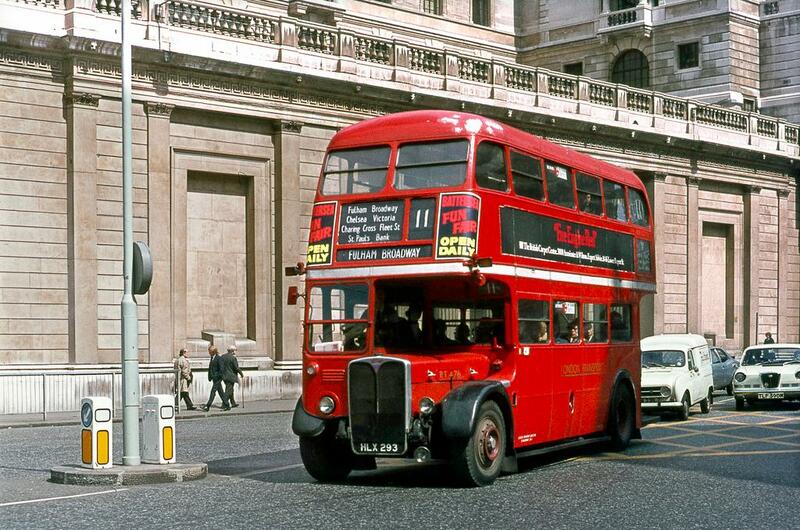 In 1963, the number 11 bus ran from Shepherds Bush, through Hammersmith, both in west London, and across central London to Liverpool Street Station in the City. The conversation between Gold and Leamus takes place in Gold’s flat which is somewhere in west London. Leamus could just as well have used the number 9, 27, 73 or 91 bus as all travel through west London from Hammersmith. So was Le Carré’s choice of the number 11 bus arbitrary? I have long had a memory of the number 11 bus. I took the bus many times in the mid-1950s to get to and from my primary school in Fulham, again in west London. My recollection was of waiting for the bus at Lillie Road Recreation Ground, frequently for quite a while, to get back to school after lunch, getting off at the Salisbury Pub stop in Dawes Road. All of a sudden, one, two, three, four, five, six or more number 11 buses would tear around the corner of Fulham Palace Road and Lillie Road on their way from Hammersmith across central London to Liverpool Street Station. It happened so often. Which bus in the convoy would stop at my bus stop was unpredictable. Most of them of course were quite empty, and the first buses would be those that had previously overtaken other number 11 buses that had stopped at earlier stops, and they didn’t want to stop. Fortunately, one bus would stop, and it would then roar away from the stop so as to keep up with the others, or so it seemed to me. I also thought that there was some sort of arrangement or understanding amongst the drivers as to which bus would stop and where. Why so many number 11 buses came together I had no idea. But though my memory may have exaggerated the number of buses that regularly travelled in conveys, I do remember a joke made by someone ‘Bananas are like the number 11 bus, they come along in bunches’. This joke can of course be applied to many situations. So was the bunching of the number 11 bus legendary? Sir – I see they are still trying to explain the peculiar way some London buses have of travelling in ‘”convoy” (the official view seems to be that it is all an optical illusion). It all brings back to me a host of twanging memories, grave and gay. The No.11 bus, travelling between Hammersmith (I believe) and Liverpool Street Station (I think) has long been notorious for this practice. I well remember the “Old No.11,” as we used to call it affectionately, behaving in just the same way in (I think) 1908, just after the change from horse-drawn buses to (as I recall) steam. I well recall (I am told) waiting at a No.11 omnibus halt for over five hours in (I remember) about 1910 and then seeing no fewer than 150 No.11 buses arrive in “convoy,” with a cheery “Hullo there!” from the leading driver! The comments of some of my would-be fellow passengers had to be seen to be heard! Incidentally, my grandfather, now dead, once told me that even as far back as the 1860’s when Hammersmith and Liverpool Street Station were still no more than tiny villages, he could well remember the old No.11 horse-omnibuses already plying between them – in convoy, of course! Despite the correspondent’s own doubts, scattered throughout the letter, as to the reliability of his or her memory, I thought it plausible until I got to the arrival of 150 No.11 omnibuses! There is no Simferopol Road in London, nor a SW56 postal area. Simferopol is the capital of the Crimea in the Ukraine, though incidentally London does have a Balaclava Road, an Inkerman Road, and a Sebastopol Road, all named after battles of the Crimean War in 1854. But it’s a funny letter.